By mastering a few simple skills and techniques, you can build a powerful repertoire of moves that will mean you and your team create and score more goals. 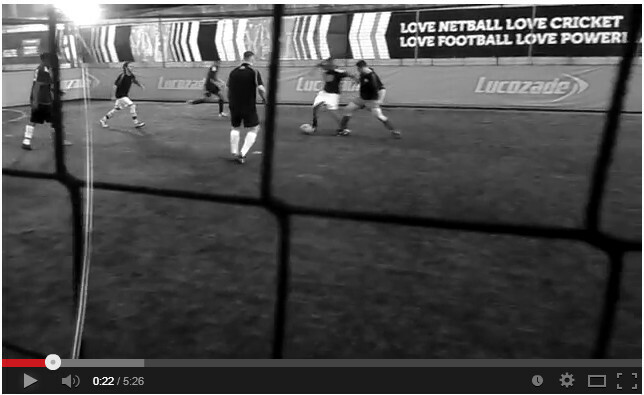 We’ve created a video guide, filmed with IFC – one of the best 5-a-side teams in the business. There are so many gems that you can pick up from watching these masters in action, so pay attention closely. We’ll provide further detail below. It might seem like indulgence to start with this, since in the 11-a-side game the backheel is sometimes frowned upon, being regarded as the domain of the ‘showboater’. But in 5-a-side it can be a great technique for disguising passes, and bringing other teammates into play. In the video you’ll see that when the ball gets played through to the front man (either by a defender or by the goalkeeper), one of the defenders comes sprinting up from the back into space. A well judged backheel can be a great way to draw your marker away and then slip a teammate in to shoot at goal. Equally, this can be done with a flick instead (if you’re playing a first-time pass) as illustrated in the video. Ensure that you can perform basic moves well first. If you can’t play accurate, nicely weighted passes using the laces and side of your foot, then concentrate on getting these right before moving onto advanced backheels. Make sure that your technique is good. Notice in the video that the backheels for passing are mostly performed with the sole of the foot, not the actual heel. This helps both control the direction and the speed of the pass, which only needs to be over small distances, but played accurately. Much better than firing the ball in an unpredictable direction off your heel – though that technique can be effective for shooting. Use them wisely, considering the balance of risk and reward. If you’re going for backheels every time then you’ll make your game far too predictable. Instead, play them at opportune moments, but consider the risk that if you don’t get it right, the opposition will have the ball and the advantage. Think about where you use them in the pitch. Get good at backheels, master playing the pass using the sole and the shot using the heel. They will add unpredictably and creativity to your game. Once you’ve mastered the backheel, opponents will be trying to stop you doing it, which is where the backheel fake is a superb weapon to have. To perform it, put the back of your sole on the ball then roll it backwards, keeping the sole of your foot in contact with the ball from start to finish. The ball will end up rolled backwards, in contact with the toe of your sole. Do that first bit reasonably fast and well, glancing behind you as you do it to make it convincing. Then, quickly roll the ball forwards and in front of you for the shot. Get this right and you can create a lot of space, as you can see on the video. Finally, if the defender seems the type who isn’t moving much at all except snapping in your general direction, it might just be worth trying to roll them instead – I.e. roll the ball across you, towards the goal for a shot – you can see this in the video as well. When a lot of people think of dribble moves, they immediately start conjuring up all sorts of complicated and elaborate moves designed to look good. The truth about skills for 5-a-side is that you are infinitely better off forgetting complicated, planned moves and developing your basic ball mastery. Ball mastery means being able to move the ball with ease and confidence to accommodate various challenges and requirements that the game demands. 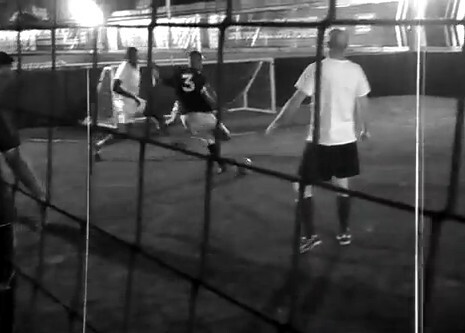 Section 3 of the video perfectly illustrates the high-level of ball mastery that a top 5-a-side player will have. Watch it and learn from it. There are three things especially worth pointing out. It’s all about the sole – you need to get familiar with using the sole of your foot. It’s a key surface that we use for 5-a-side football. The sole of the foot allows you to get the ball under control and quickly move it in any direction, giving you options that you don’t have with areas on the rest of your foot. Using both feet – you need to be able to use both feet well. This doesn’t mean that you need to be completely two footed, but it does mean that your weaker foot is for more than just standing on. You need to be able to move the ball from sole to sole, one foot to the other. That alone is an effective technique for dribbling round players. Being able to use fakes – As your ball mastery improves, and you’re able to use the sole of your foot well, you’ll be able to add much more disguise to the moves that you’re about to do. This might involve rolling the ball one way before going the other. Being able to throw the opponent the wrong way is vital to being a really creative player. There are so many good examples of this in the video where a player shapes to shoot and then drags the ball across to do something else. It’s a classic move that you need to know and one we’ve covered in a separate article. A textbook fake, to throw-off the defender. Master all of this and you’re well on your way to being a very good, creative 5-a-side player. The key to all of this is practice, not just alone but in a game situation. Good luck and let us know how you get on. The dummy pass / shot – an absolute must-have for the 5-a-side player. Skills with Joe Smith – Joe Smith, YouTube skills sensation gives us his top 5-a-side skills and tips. We’ve all played with someone who uses them badly. You stop making the runs for them and worse still, you’re just worried about them giving away possession all the time. Me, I err on the side of caution and only use them if I’m certain, though that might mean there are a few opportunities that go begging. Happy new year to you and yours Dene. Good luck with the site in 2014.